All Help-QUT participants were given the case study of Singapore Bus Service Transit (SBS Transit) to propose ways of improving the company’s performance. The first team suggested the live GPS bus tracking system which reports bus locations to provide passengers accurate arrival or departure information; and a smartphone app which enables passengers to select and book their preferred bus stop to hop on a bus. “There is a high possibility that our suggestions may reach Singapore and SBS Transit in improving the country’s public transport,” said Saw. The third runner up team proposed adding foldable seats in buses to increase capacity and the building of special bus lanes similar to Sunway’s Bus Rapid Transit (BRT) to provide bus services on elevated tracks in order to avoid heavy traffic. Other achievers present include Amanda Yong Poh Yokeand Chai Chuan Wei who emerged top scorers in the Certified Public Accountant (CPA) examinations. They received a cheque of RM500 each from the CPA Australia. “It was a surprise to me and I would not have done it without the sincere guidance from my lecturers,” said Chai. Also at the tea party was Dayang Melati, who hails from Indonesia, she was part of the “Avengers” Team at the Maybank Go Ahead Challenge where they emerged 2nd Runner Up. Similar to the television programme The Apprentice, Dayang was one of 10 participants selected to play the roles of Chief Executive Officer and Chief Operating Officer at the intensive 7-day international business case competition. “The competition was stressful but exciting as it tests one’s endurance, intelligence and passion through business case analysis, treasure hunts, riddles and other tasks. We even had to complete our missions spontaneously in an airport and catch a flight to Indonesia to continue the game,” described Dayang. 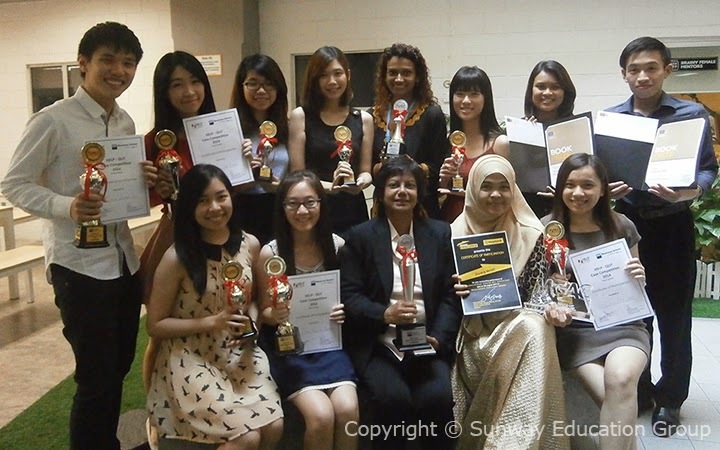 All these AUP high achievers share one thing in common, they were thankful to have chosen the right degree programme. They believed that the unique learning and teaching AUP framework helped to gear them up for their various achievements. In particular, they found that the AUP Professional Development (PD) of the Business Learning Experience Project was the toughest yet the most helpful subject as it requires students to develop business plans, prototypes, models or projects. It cultivates interactive team-based learning and help develop students’ creative competencies in communication, critical thinking and problem solving, and soft skills needed for the business world. Greeja Hemalata De Silva, Head of the Australian University Programme at Sunway College was pleased with these outstanding achievements. “We are blessed and thankful to the lecturers and coaches who have been instrumental in the success of our AUP students,” said Greeja.